Even after the Olympics in Beijing, economic development has been continuing as well as the expansion of the infrastructure including the roads inside the city. Against this background, Beijing Luxin Dacheng Exquisite Paving Co., Ltd. is carrying out the construction of special pavements centered on landscape pavements together with the manufacturing and sales of pavement materials to support diversifying needs. In addition, not only limiting itself to road construction that contributes to industrial development, the company has been planning for business development in response to market needs based on the vast experience it has gained in Japan in order to realize the creation of comfortable roads that are considerate to the environment. 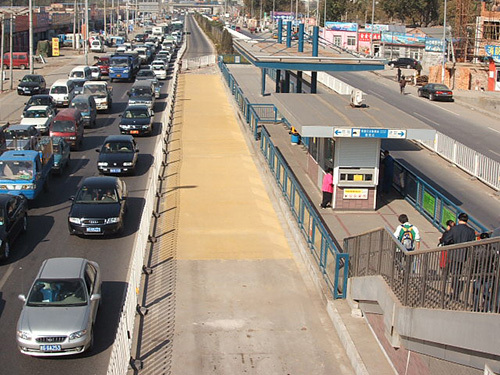 In recent years, the semi-flexible paving of the dedicated bus lanes inside Beijing city have been awarded the science and technology first prize by the Beijing Municipal Road and Bridge Construction Materials Group and the technology second prize by the Beijing Municipal Road and Bridge Holding Group Company, and the company’s landscape paving has also been highly appraised in the districts surrounding Beijing. : Beijing Luxin Asphalt Concrete Corporation and Beijing No.1 Municipal Construction Engineering Co., Ltd.
Semi-flexible paving on bus lane (Beijing city). 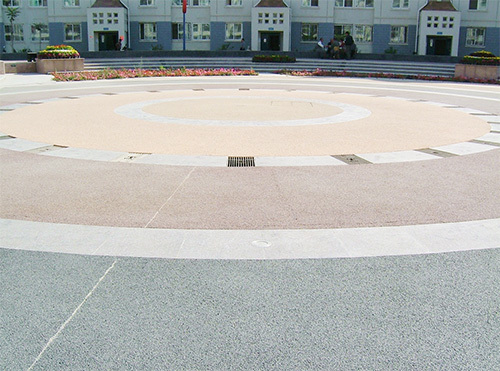 Permeable gravel paving (Beijing city).